Oh boy - who'd a thunk using recycled stuff could turn out this good. Sheesh. 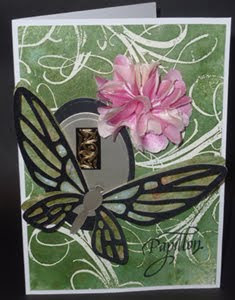 I'm using the French sentiment for Butterfly and the large flourish for the background - both stamps from Quietfire Design. And I created a new Fabric Flower using a silky material and Ecoline inks. Click on Card image to see details, descriptions and close ups etc. Enjoy. You can also find the basis of the floral tutorial that I used HERE which I altered slightly. Beautiful fabric flower and a lovely card, Yogi! So pretty! Thanks for playing along at Card Cupids! LOVE that flower. And your butterfly is stunning too. That flourish is perfect here. Wonderful card. Thanks so much for playing along with us at OPUS GLUEI. It's always such a thrill to see your entries. Gorgeous card. I love that butterfly, and your backing paper is lovely. Thanks for joining us in the Spotlight at crafty Cardmakers. Pretty card. Lovely flower and background pattern. Thank you for joining Little Claire's blog challenge. Thanks for linking to my blog for the flower design! Beautiful flower and such a gentle feel to your card, very soothing and lovely. Hi Yogi, glad to see you again this week! I just love your flower! It has dimension, and layers, all of which are to die for! Thank you for playing along with us @ OCC, and hope to see more of your beautiful work! Wonderful card! thank you for playing along with my flutter by challenge! beautiful Card! Thank you for joining us at Delightful Challenges and showing us your green! Your card is wonderful - love all the glittery shine and your packaging recycling is gorgeous. Your fabric flower is the perfect finishing touch! Great job on the package recycling challenge. So happy you joined in the fun with us this week at Our Creative Corner. Just beautiful Yogi!! Of course I love the swirls!! I love the fabric flower on your card! Thanks so much for playing along with us at Our Creative Corner! Pretty Card! Thank you for playing along at paper playtime! Thanks so much for playing along with us @ Paper Playtime!